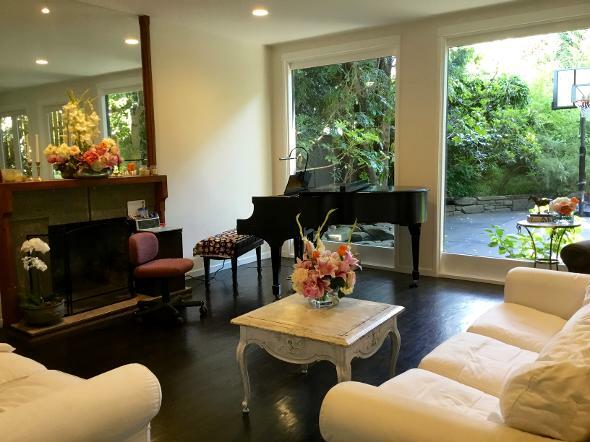 Arriving at the studio, you'll walk through a private, gated entrance and soon be at the door to the light-filled piano room, where snacks, fresh fruit and a refreshing drink await you. The piano room. Excellent, high-end Yamaha digital pianos with integrated iPads make learning easy and fun. A student winning a note identification game on the iPad during weekly Music Lab. A Japanese garden view outside of the piano room. Wait until you hear the beautiful tone of the fully-restored Steinway - truly, a gorgeous, bell-like sound fills the studio. I love my lessons with Mrs. McLean!